Vietnam's culture demands that you observe certain strictures, although the Vietnamese are generally very forgiving of unintentional faux pas. Petty urban crime and military sensitivity aside, the Vietnamese are very welcoming to their visitors. Vietnamese hospitality will make you feel right at home, more so when you keep the following etiquette tips in mind. Dress conservatively wherever possible. The Vietnamese are generally modest about clothing and look askance at visitors wearing far too little in public. Dress lightly if you must, but not overly so—avoid tops with plunging necklines, spaghetti-strap tops, and short shorts where possible. This goes double for visiting temples and pagodas— keep your arms and legs covered, and hide as much bare skin as you can. It's extremely rude to go to such places while insufficiently dressed. Don't show off; keep a low profile. Flaunting wealth is impolite; don't look like an Ugly American with far too much gold and far too little sense. Don't carry more money than you need when walking in public. Don't wear too much jewelry. Not only are these good manners you also reduce the risk of becoming the next victim of a drive-by bag snatcher. Don't talk about the Vietnam War. Avoid talking about politics altogether. The Vietnamese have mixed feelings about the "American war," and are understandably averse to bringing it up in the presence of American citizens. Don't cause Vietnamese to "lose face." The concept of "saving face" is extremely important in East Asian social relationships. Avoid behavior that causes embarrassment to another party, and holds back behavior that can be misconstrued as overly aggressive. Don't force money on other parties. Don't wheedle or insist. Most importantly, don't lose your temper in public; try to be cool and collected whenever possible. Don't be too camera-happy. Ask people's permission before you take their picture—not all of them want their picture taken. This goes double for pictures in rural ethnic villages. This goes triple for military installations and equipment! 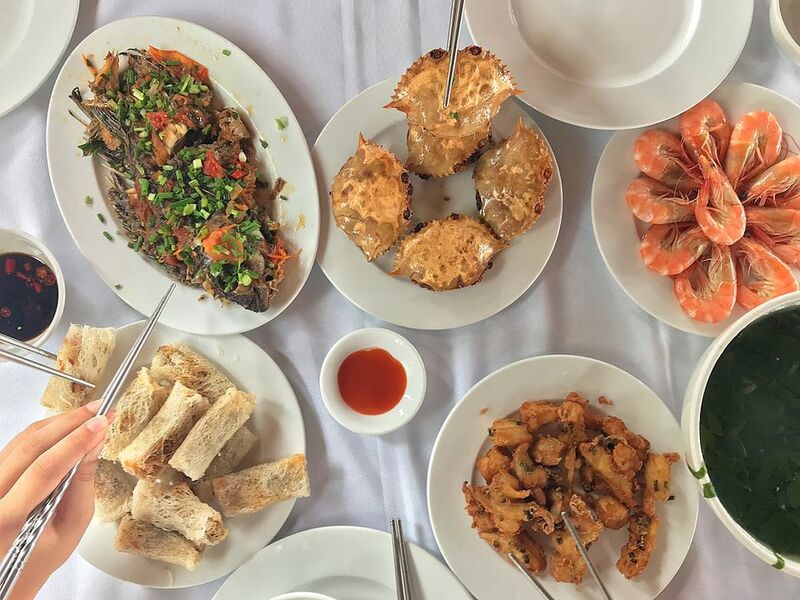 Food in Vietnam ranks among some of the best you'll ever experience in Southeast Asia. The Vietnamese tend to eat in groups, rarely alone—in most traditional Vietnamese restaurants, you'll be seated at a table with several dishes placed in the center. The food in the middle of the table belongs to everyone; you'll help yourself to your share of the dishes in the middle, filling your own plate as needed. Use the serving spoon. Don't use the same utensils you put in your mouth to pick up from the communal food dish in the middle; Vietnamese find this distasteful. Use your chopsticks right. Do not stick the chopsticks in the bowl, or upright in the rice; this reminds Vietnamese of the two burning joss sticks used for funerals and is "unlucky" for auspicious-minded locals. To signal that you're done with your meal, place the chopsticks across the top of the bowl instead. Finish all your rice. Leaving a significant amount of rice in your bowl is considered wasteful. Don't get more rice than you think you can finish. Be as noisy as you like. Slurping and smacking while eating Vietnamese noodles is accepted in these parts; it signals that you're enjoying your meal! Go ahead and drink, but not to excess. The Vietnamese enjoy their potent potables, but hardly ever to excess; habitual drunkenness is frowned upon in society. Drinking groups tend to be male-dominated; women drinking in public is simply not the done thing.